The Hellfire Caves (also known as the West Wycombe Caves) are a network of man-made chalk and flint caverns which extend a quarter of a mile underground. They are situated in West Wycombe, at the southern edge of the Chiltern Hills and lie directly beneath St Lawrence’s Church and Mausoleum. Supposedly of very ancient origin, the caves were excavated between 1748 and 1752 for Sir Francis Dashwood, and the Church and Mausoleum above were also constructed by Dashwood around the same time. The caves were used as a meeting place for Dashwood’s notorious Hellfire Club, whose members included various politically and socially important 18th century figures. The journey begins by entering a flint entrance, built to look like a Gothic church. You then walk through a series of hand carved tunnels and alcoves; past exhibits, which tell a fascinating story. The final destination is the Inner Temple which is reached by crossing the River Styx, and is three hundred feet below the Church on top of the hill. 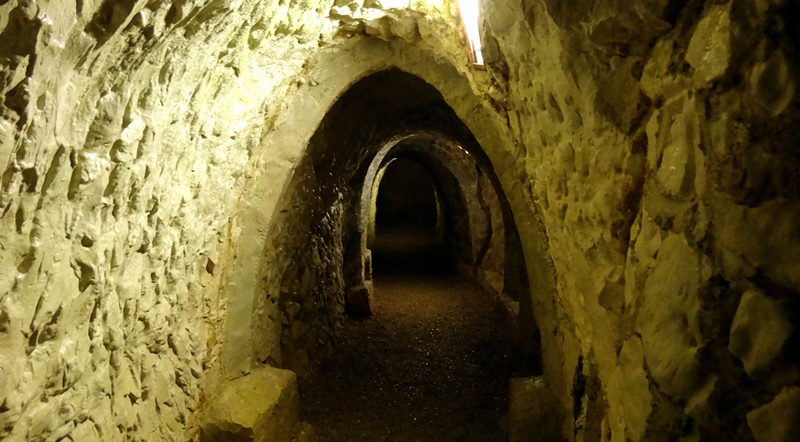 There has been several sightings of ghosts at the caves by staff and visitors, including a bride called Suki and Sir Francis Dashwood’s close friend, Paul Whitehead.